Deadly Tunica-Bound Bus Crash: Was It Avoidable? | Merkel & Cocke, P.A. Deadly Tunica-Bound Bus Crash: Was It Avoidable? Home/Bus Accident/Deadly Tunica-Bound Bus Crash: Was It Avoidable? At least three patients were in serious or critical condition, and at east one person has already been discharged. We are all continuing to pray for the survivors, and for the families of the two people who were killed in the crash. The investigation is ongoing, but we hope the findings offer some peace to the families. Why did the bus flip over? FOX 13 reports that “the crash happened at the bottom of the overpass on the highway. They believe the bus hit a patch of ice and flipped. Notably, police said three other wrecks happened in that same area on Wednesday” (emphasis ours). The patient who was discharged from the hospital told FOX 13 that the bus spun at least two times, and picked up speed on the second spin. At this time, it appears as though the bus driver lost control of the vehicle because of those icy conditions. There is no definitive answer about whether he was speeding. Federal records show that Teague has a long history of service violations. Though the company reported no crashes in the last 2 years, the “Federal Motor Carrier Safety Administration [FMCSA] auditors conducted a surprise inspection of the three buses comprising the Teague VIP Express fleet in late February 2017. Among each of the vehicles, auditors found what they call ‘out of service’ violations. In two of Teague’s buses, the steering system components were worn, welded or missing. One also had axle parts that were defective or missing. 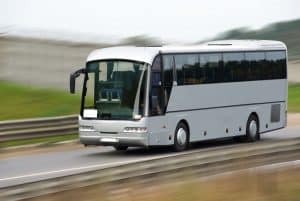 And in another bus, the wheel rim was cracked or broken.” In addition to these serious violations, there were nine minor problems identified, as well. A spokesperson for the FMCSA told the Commercial Appeal that an out of service violation “’is so serious it poses an imminent hazard.’ The vehicle is put out of commission on the spot.” The vehicles must be towed to a repair shop, and fixed by a certified mechanic, in order to be returned to the road. The stretch of I-269 where the fatal bus crash occurred opened on October 26, 2018, as part of the “I-269, the Fast Track to Tunica” campaign. The campaign was designed to help bring in tourists to Tunica’s casinos. As the Daily Memphian explains, casino patrons would “now have a faster, safer and more direct route to the exciting live music, gambling and sports wagering entertainment that can be found here in Tunica.” The new path was supposed to help drivers avoid more congested highways in Memphis. At this time, there is no word if Fitz Tunica Casino & Hotel – the destination for the travelers – properly investigated the background of the busing company prior to the accident, either. If Fitzgerald failed to conduct the proper research, they could be held partially liable for the incident. As we mentioned, police reported three additional wrecks in the same area that the deadly bus crash occurred – a slippery little bridge by the overpass. While Mississippi does not get a lot of snow, we do get hit with storms on occasion, and it worries us that no travel advisory was issued until 20 minutes before the fatal crash. We understand that tourism plays an important part of Tunica’s economy, and Mississippi’s economy as a whole. But if people aren’t safe, they won’t come here. This tragic loss, coupled with the information that multiple other vehicles were involved in accidents in that same area, leads us to believe that better safety warnings should have been given long before they were. We also want to know, why didn’t the bus operator heed that advisory? We know that the driver may not have known about the travel risks from the start. There is no federal rule that says bus companies need to track weather patterns or advisories, the Commercial Appeal claims. Still, not heeding advisories when they are issued means that countless other people could be at risk when they travel on I-269, whether they are coming for a fun day, or driving to or from work at one of the casinos. If you were injured in a wreck on I-269 while traveling to Tunica, our vehicle accident lawyers can help. We know how to build a case for liability, and will fight to obtain the compensation you need to pay your bills, so you can focus on your recovery. Please call Merkel & Cocke, P.A. at 662-799-1633, or fill out our contact form, if you need help. We proudly represent injury victims in Tunica, Gulfport, Biloxi, Lula, and throughout the Gulf Coast.